Movement: Yeah...you've been more active and flippy lately. You like to kick around bedtime and first thing in the morning, and then in the early evening. How I'm Changing: I'm feel humongous. My belly is getting rounder, and I'm feeling more full o baby daily. 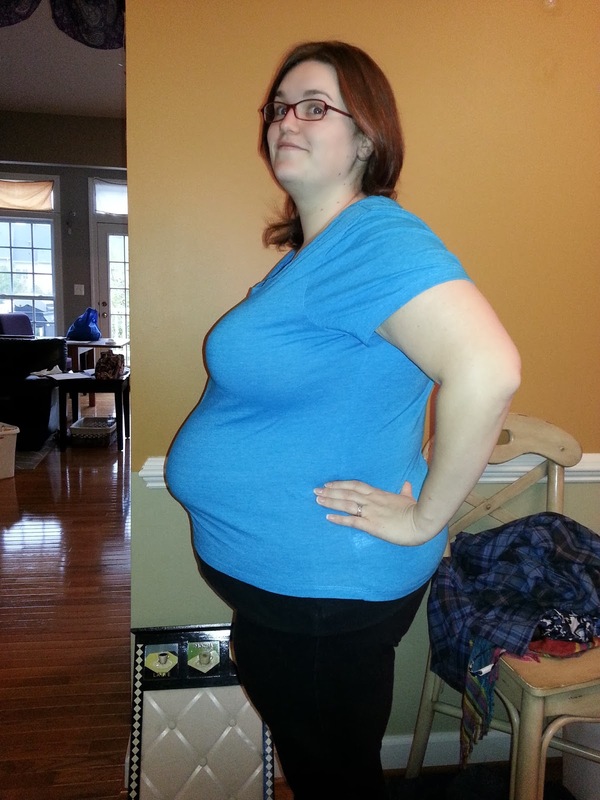 Maternity Clothes: I bought some maternity clothing off of a lady, and I'm glad to pick up some jeans and long sleeved shirts. $25 for a few hundred dollars in clothing. How I'm Feeling: I feel like things are coming together actually. Since I last wrote, we found a doula we really liked, and went to the midwife and picked up some schedules for classes they offer. I think, despite having a really shaky time after my glucose test this morning, I had a really productive afternoon. Sleep: I feel like I'm awake every hour or two between having to use the bathroom and dad's snoring. It's annoying...and I think napping it a valid option. What I miss: Having energy, not gaining weight faster than I ever have before. What I'm Eating: Food? Johanna has done an awesome job of making us do things like plan meals, so we have food to eat, and we aren't living off of cereal. Awesome. Best Moment this week: I got over my sick! You're moving more, I got a great deal on some maternity clothing, and we picked out some awesome furniture for you.